Just because hot dog season is nearly at an end doesn’t mean the mustard needs to languish in your fridge. Here are 10 ways to use it this fall. 1. Vinaigrette. A mustard dressing is a classic on tender greens, but it’s also delicious with sweet roasted parsnips and turnips or a zippy coleslaw. To make a rich mustard dressing without much oil, bake it first. Yes, bake the mustard. 2. Roasts. To create a beautiful crust for a leg of lamb, pork loin or turkey breast, rub it with an herby mustard before roasting. 3. Pasta. To add acidity to a cream sauce for pasta, add a few spoonfuls of grainy mustard. 4. Mashed potatoes. To cut through the richness of mashed potatoes, add some mustard. Then sprinkle bacon on top. 5. Fish. Sturdy fish like salmon and tuna are wonderful with a mustard crust. Brush it on salmon fillets before broiling or on tuna before searing. 6. Mussels. Swirl mustard into lager-steamed mussels and garnish with dill. 7. Butter. Blend mustard with butter and lemon for an awesome topping for toasts. 8. Eggs. Mustard is, of course, key to great deviled eggs. But it also makes a delicious sauce for poached ones. 9. Chicken. 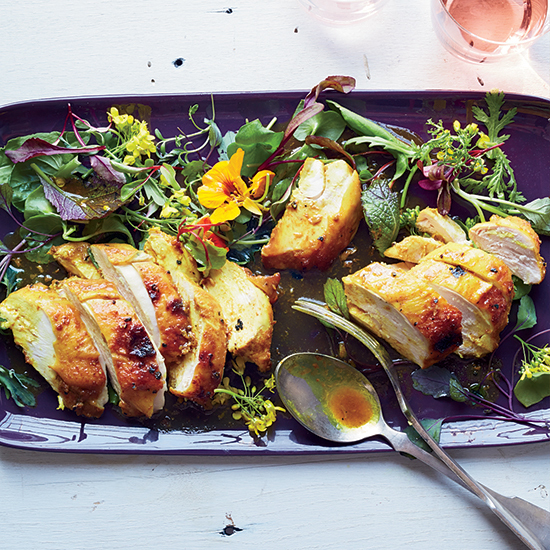 Mustard brightens chicken stews and creates a lovely glaze for chicken breasts. 10. Spaetzle. For a more interesting version of the German dumpling that will still go well with lots of stews, add mustard.